Hans Worst Hits of the 80’s- Fire Lake- Bob Seger. The song was originally going to be on Seger’s 1975 album Beautiful Loser- but it wasn’t finished. Seger should have left it at that. After two big hit albums- that were critical and commercial successes- I found Against The Wind a big disappointment and a pretty bad album to be honest. I liked Night Moves and Stranger In Town- and I like a lot of his earlier stuff before he ‘hit it big’ and I really wanted to like Against The Wind. I certainly remember listening to it a lot in early 1980 but it just didn’t do it then or now. The album seems full of play it safe- craft man written songs. What a boring album. 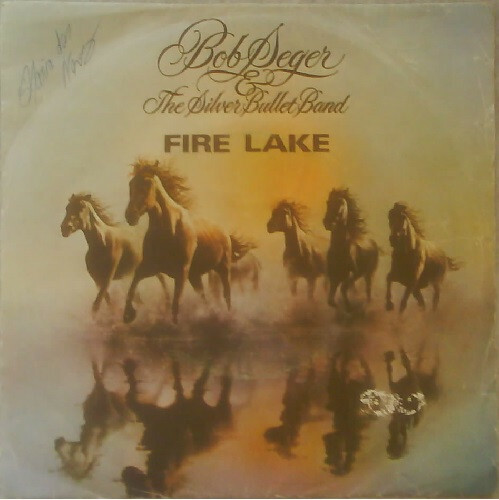 I really can’t say I like a single song on the album- and the singles Fire Lake #6, Against The Wind #5, You’ll Accomp’ny Me #14 and The Horizontal Bop #42 were only on the charts due to the fact it was Bob Seger. A lazy album and Fire Lake with backing vocals by The Eagles. Reading a quote from Seger- Fire Lake is one of his favorite songs- it is about ‘taking risks”- odd because the album “Against The Wind” is all about playing it safe, not taking chances. And poor Bob on Fire Lake sounds like he is trying to make a bowel movement. He grunts his way though the song. AWFUL! I don’t really like videos with songs. When they are good or memorable (Sledgehammer, Total Eclipse of the Heart) those images come to mind rather than my own interpretations. I guess there was no official video so the maker pinched sequences from Easy Rider and some sexist stuff (unless that’s also in the film – never seen it). i think who wants to buy a lake sounds a lot better!! This one I don’t hate…maybe because it hasn’t been burned to the ground on the radio. I didn’t like anything after this album. I will say he didn’t sound inspired with this album like the earlier ones. Not a bad song, just not a great song. I liked the song. Against the Wind bored me to tears. I think his pinnacle was Turn The Page. I respectfully have to disagree with you on this one. While I also prefer some of the early Seger tunes like “Ramblin’ Gamblin’ Man”, “Katmandu”, “Turn The Page” or “Old Time Rock and Roll”, I’ve always liked “Fire Lake” as well. In fact, if I recall it correctly, it was my introduction to Seger when that tune came out in 1980. I think that album- Against The Wind- which I listened to again today- is one of the worst albums ever by a ‘major’ artist. I think we’re probably have to agree to disagree on this one.😀I’ve listened to the album, and while it’s safe to say it’s not the greatest piece of rock I’ve ever heard, I also don’t see anything particularly wrong with it either. In fact, I can hear a lot of classic Bob Seger on this album. But there are also elements of ‘80s pop and maybe that’s what you may find irritating. I will in tomorrows post!!! This is a strange coincidence but a few hours ago I was just thinking for some reason about Bob Seger and that he might be my least favorite of the major classic rock artists – then I read this just now! LOL.. I think he is very over-rated..not terrible but a grade c rock artist.